How to make your colleagues co-workers and get them inspired to join you in your work as a disability coordinator. an interactive presentation. 3 Who are you? A disability coordinator? One of his or her colleagues? 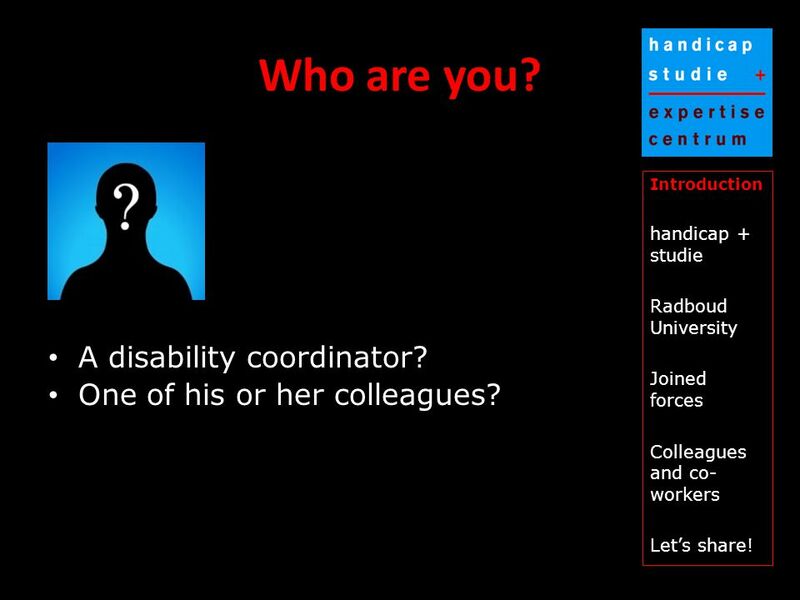 Introduction handicap + studie Radboud University Joined forces Colleagues and co- workers Let’s share! 5 handicap + studie Introduction handicap + studie Radboud University Joined forces Colleagues and co- workers Let’s share! We support universities to be (more) accessible for students with disabilities and raise awareness among teachers and support servicers. To establish a connection with the daily activities at a university, handicap + studie prefers to work closely with an educational institution. 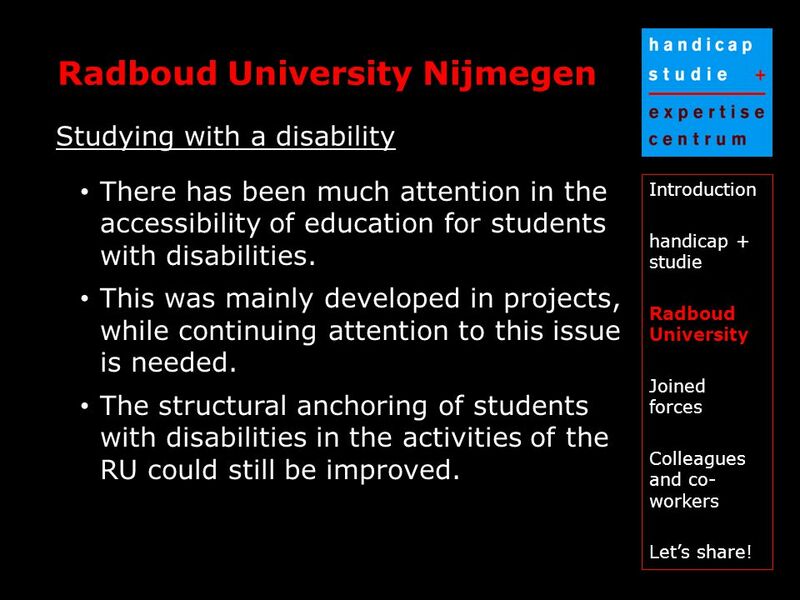 7 Radboud University Nijmegen Introduction handicap + studie Radboud University Joined forces Colleagues and co- workers Let’s share! a public university with a strong focus on research located in Nijmegen, the Netherlands. established since 1923 and situated in the oldest city of the Netherlands. it has seven faculties and enrolls over 19,130 students. 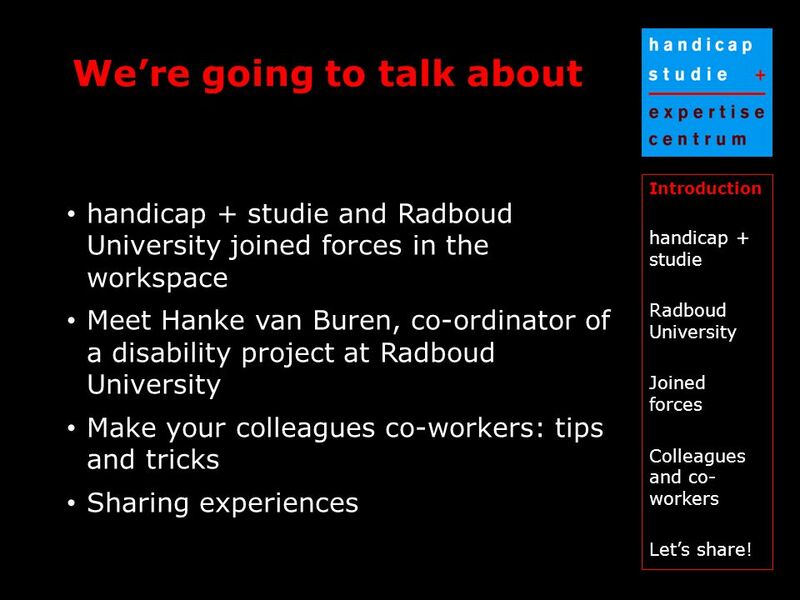 9 Meet Hanke van Buren Introduction handicap + studie Radboud University Joined forces Colleagues and co- workers Let’s share! Co-ordinator disability project Her job is to get structural anchoring of disabled students at the activities at the university by getting her colleagues involved in the subject. How? By making them co-workers. 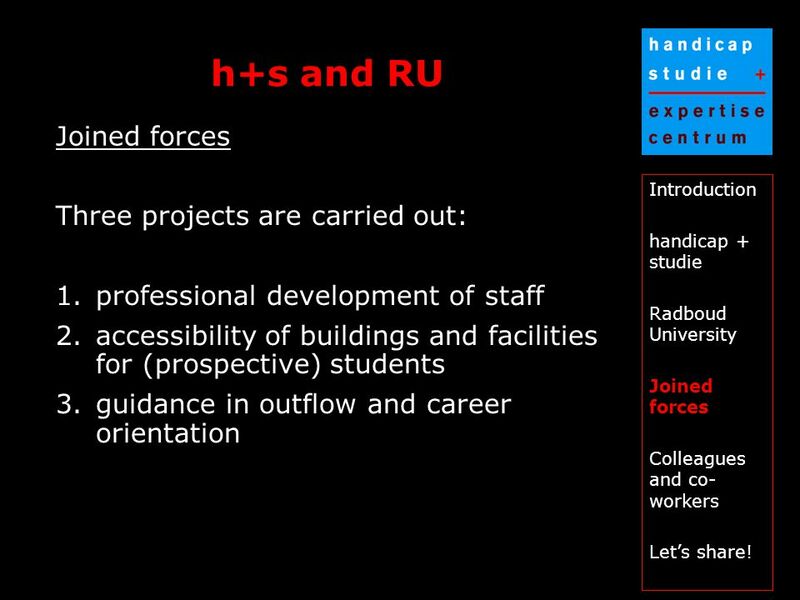 10 h+s and RU Introduction handicap + studie Radboud University Joined forces Colleagues and co- workers Let’s share! 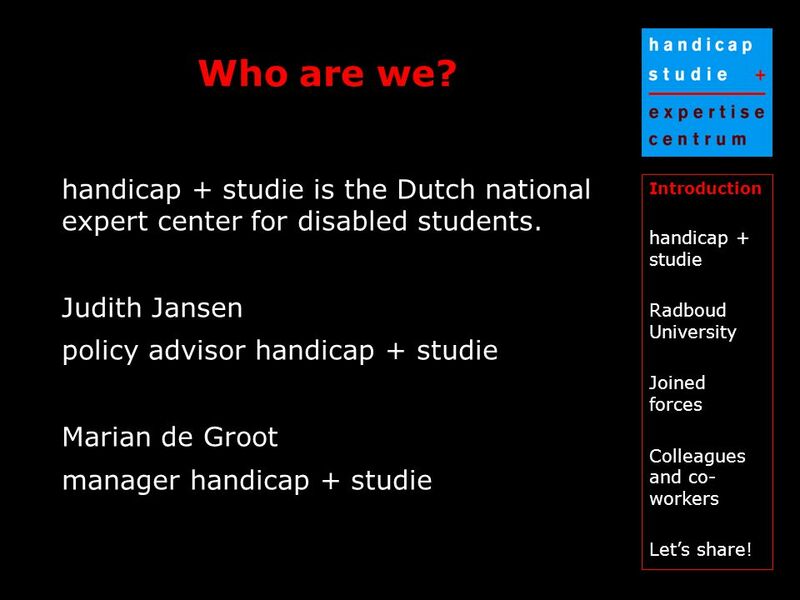 Joined forces Radboud University and handicap + studie joined forces to get staff of the university involved in the subject handicap + studie has national expertise in the subject. Hanke van Buren knows her way within the university. 12 How do we do it? Introduction handicap + studie Radboud University Joined forces Colleagues and co- workers Let’s share! 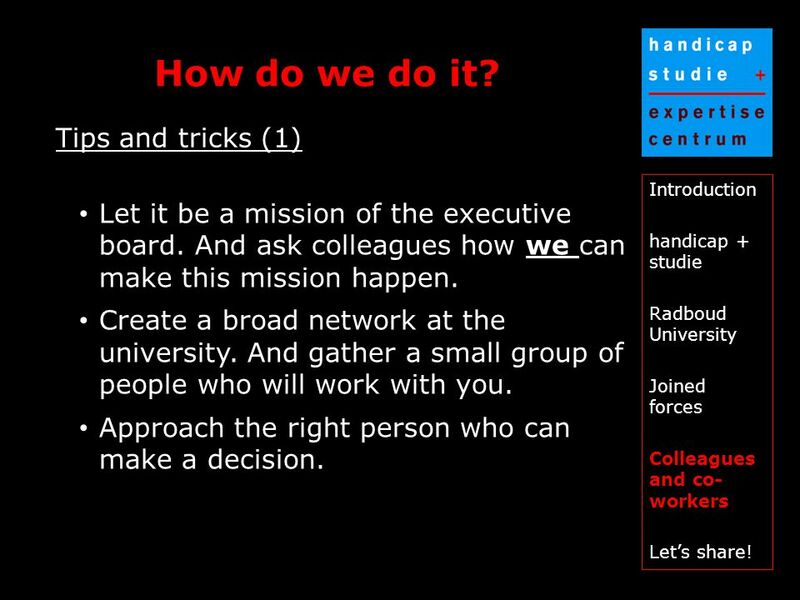 Tips and tricks (1) Let it be a mission of the executive board. And ask colleagues how we can make this mission happen. Create a broad network at the university. And gather a small group of people who will work with you. Approach the right person who can make a decision. 13 How do we do it? 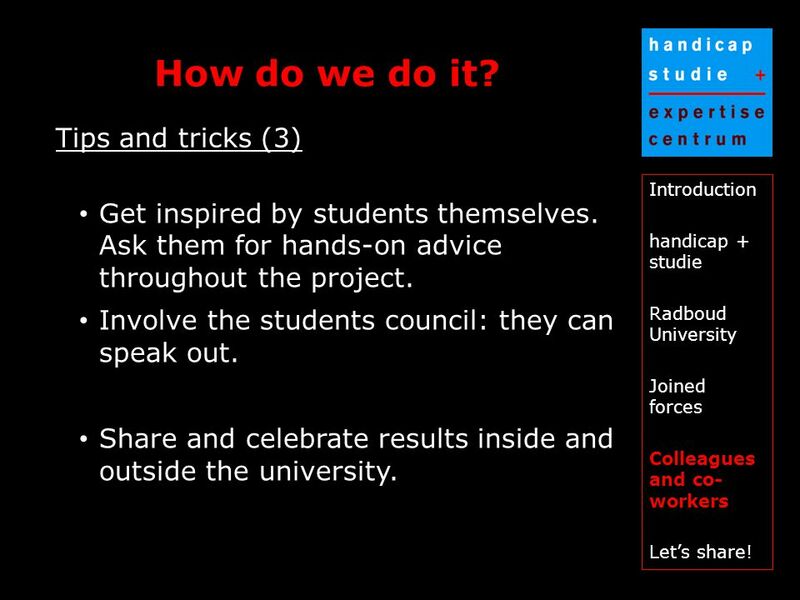 Introduction handicap + studie Radboud University Joined forces Colleagues and co- workers Let’s share! Tips and tricks (2) Look at regular activities and ask your colleagues how the subject can be part of these activities. Don’t make it exclusive. Try to enthuse them. Motivate them and pull them over the line. Keep telling facts and personal stories. Be constructive and pro-active. 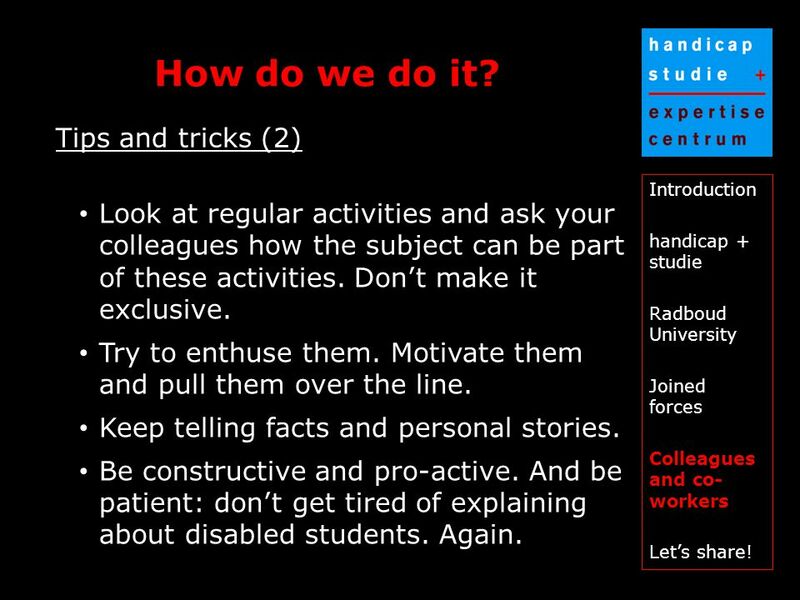 And be patient: don’t get tired of explaining about disabled students. Again. 14 How do we do it? Introduction handicap + studie Radboud University Joined forces Colleagues and co- workers Let’s share! Tips and tricks (3) Get inspired by students themselves. Ask them for hands-on advice throughout the project. Involve the students council: they can speak out. Share and celebrate results inside and outside the university. 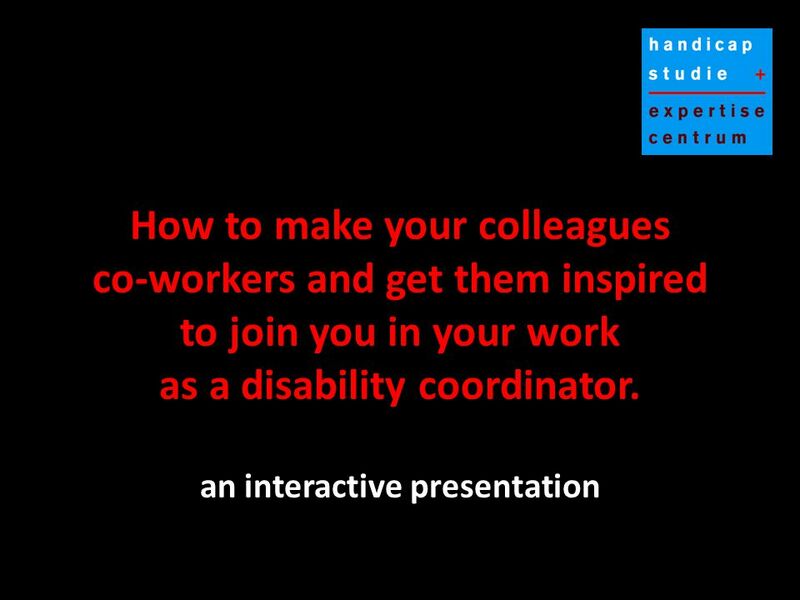 Download ppt "How to make your colleagues co-workers and get them inspired to join you in your work as a disability coordinator. an interactive presentation." Co-Teaching Jenn Hickey – Regular Ed. Teacher Christine Jones- Special Ed. Teacher. An Introduction Session on Sessional Teaching The Mathematics Discipline Swinburne University of Technology.  Community Engagement For Local Government Councillors It is the business of council to involve the public in the business of government Presentation. Are you Undecided? Your in luck! If you are looking for direction you have come to the right place!! More challenging behaviour Scenario 1: Defusing a conflict between pupils Behaviour Scenarios Resources to support Charlie Taylor’s Improving Teacher Training. with For students choosing post 18. What Good coaches do “When coaches and teachers interact equally as partners, good things happen.” Jim Knight. Hogeschool van Amsterdam Interactieve Media The art of pitching Hoorcollege marketing blok 2 week 6. 19 november 2008, Rennes1 Introducing Mentoring The European Council of Doctoral Candidates and Junior Researchers Nora de Vries on behalf of EURODOC.